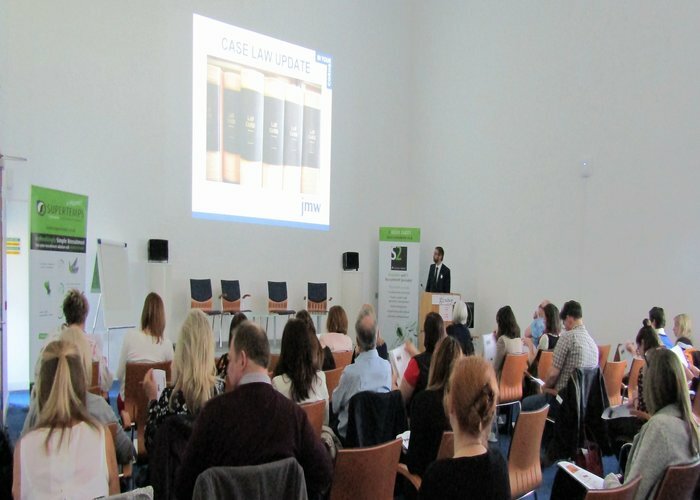 A top recruitment company and leading firm of solicitors joined forces to deliver free employment law events. Up to 100 people attended the seminars at M-Sparc on Anglesey and the OpTIC Technology Centre, St Asaph. Organised by Supertemps and S2 Recruitment – which have offices in Colwyn Bay, Bangor and Gaerwen – and the Manchester headquarters of JMW Solicitors, the sessions covered a variety of topics from workers’ rights to professional disputes, The Gig Economy and changes to IR35. JMW partner Simon Bloch and associate Michael Legge also discussed The Good Work Plan, which was released in December and reveals how the UK Government will implement recommendations from the Taylor Review of Modern Working Practices. “The seminars were well-received, it was great to see so many people taking advantage of the free help and advice,” said Simon. “We had a wide range of people in attendance, from company owners and managers to employees, who all took something from them. Sarah Ellwood, managing director of Supertemps and its executive division S2 Recruitment, said the sessions are one of the key dates in the calendar for clients in North Wales. “The free seminars we’ve held over the years have always been popular, but never have they come at such a crucial time for employers,” she said. “The Good Work Plan in particular was a hot topic that raised questions, and other areas of employment law were debated and discussed at both events. Supertemps is one of the leading recruitment firms in North Wales and the North West, having recently opened a new office for S2 Recruitment on Anglesey, and with plans to extend its services into north east Wales later this year. Visit www.jmw.co.uk for more on JMW Solicitors.